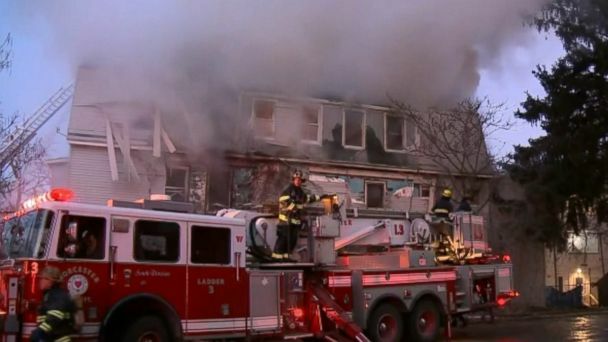 A Worcester, Massachusetts, firefighter died early Sunday while battling a massive fire in a 3-story building, officials said -- the latest in a sad history of firefighter deaths in the city. Firefighters responded to a fire at 7 Lowell St. in Worcester just before 4 a.m., according to fire officials. When conditions deteriorated and the fire went up to five alarms, five firefighters were forced to escape the blaze using ladders, officials said during a news conference Sunday. Two firefighters were taken to the hospital, but Christopher Roy, 36, succumbed to his injuries, officials said. "It's important for us to know and appreciate how incredibly hard the men of the Worcester fire department fought to save Chris' life, and we know how devastating this is to them," said Worcester City Manager Edward M. Augustus. Roy was assigned to Ladder 4, Group 3, at Webster Square Fire Station. He had been for the department for two and a half years, according to Worcester Fire Chief Michael Lavoie. Roy had an 8-year-old daughter, Ava, and is survived by his mother, Michelle, and his father, Ron, officials said during the news conference. "Firefighter Roy paid the ultimate sacrifice last night, doing what he always wanted to do -- helping people and saving lives," said Mayor Joseph Petty. This is not the first time that the Worcester Fire Department has suffered a major loss. Six Worcester firefighters died in a cold storage warehouse fire on Dec. 3, 1999, in a tragedy that became known as the "Worcester Six." Then-President Bill Clinton and Vice President Al Gore joined mourners at the memorial service. On Dec. 8, 2011, Worcester firefighter John Davies, 43, while responding to a fire when the building he was in collapsed, according to the National Fallen Firefighters Foundation. "Once again, December has proven to be the cruelest month of the year for the Worcester Fire Department," said Worcester Mayor Joseph Petty at the press conference on Sunday. "The loss is especially gut-wrenching in the wake of the anniversary of the Worcester Six on Dec. 3, 1999," said Augustus. "Every day, our fire fighters selflessly risk their lives without a second thought."